For users of the Particle Tracing Module, COMSOL Multiphysics® version 5.4 includes support for Accumulators in the Velocity Reinitialization feature, the option to offset velocity distributions of released particles by any expression, and a new benchmark model named Quasi-2D Turbomolecular Pump. Read more about these new features in the Particle Tracing Module below. You can now add Accumulator subnodes to the Velocity Reinitialization node. Whenever a particle's velocity gets reinitialized, you can use this functionality to increment a field variable in the location where the reinitialization takes place. 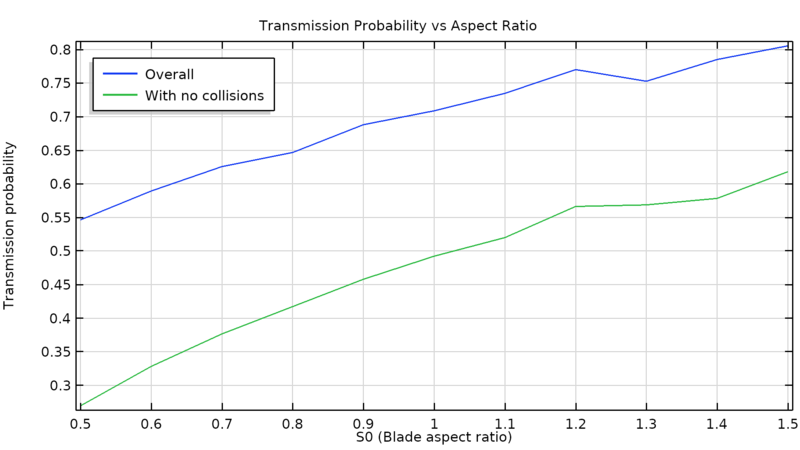 The accumulated variable can be used, for example, to compute the spatial density of collisions that take place within the simulation domain. A single particle (red) is subjected to a velocity reinitialization, causing it to increment the accumulated variables in the mesh element where it changed direction. 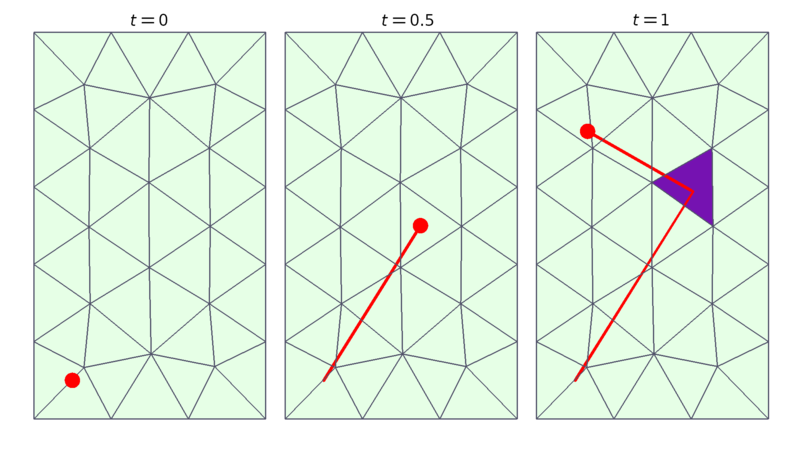 A single particle (red) is subjected to a velocity reinitialization, causing it to increment the accumulated variables in the mesh element where it changed direction. When you release particles with a velocity distribution, you can now offset the velocity distribution by any user-defined expression. In previous versions, you could only offset the velocity distribution by the velocity of a rotating frame of reference with respect to the inertial (laboratory) frame. The main use for this functionality is to trace particles in a frame of reference that is moving at some velocity relative to the laboratory frame. This functionality is used in the new benchmark model Quasi-2D Turbomolecular Pump. 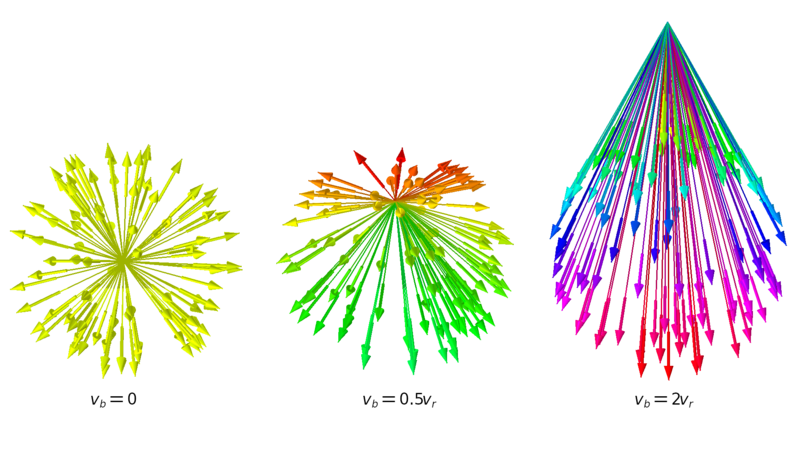 Spherical velocity distributions where the background velocity to offset is zero (left), half the radial velocity (middle), and twice the radial velocity (right). The color expression is the particle speed. Spherical velocity distributions where the background velocity to offset is zero (left), half the radial velocity (middle), and twice the radial velocity (right). The color expression is the particle speed. COMSOL Multiphysics® version 5.4 brings a new benchmark model for users interested in vacuum system simulation. Transmission probability as a function of blade size in a single-stage turbomolecular pump. This benchmark shows the effect of three different parameters on pump performance: blade speed, angle, and size.